HERES AN OUTSTANDING, 1880 VICTORIAN HALL TREE, COMPLETE WITH THE MATCHING DETACHED BEVELED MIRROR! "ABSOLUTELY BEAUTIFUL" BEST DESCRIBES THIS ORIGINAL SET. THIS RARE EXAMPLE IS HIGHLY CARVED, FINELY DETAILED, AND REFLECTS THE EXPERT CRAFTSMANSHIP OF THE ERA. THIS QUARTER-SAWN, TIGER OAK SET HAS BEEN PROFESSIONALLY REFINISHED, FEATURES A LARGE STORAGE COMPARTMENT, AND INCLUDES TWO ORIGINAL ORNATE, HAT/COAT HANGERS. THE DIMENSIONS ARE: BENCH 55"W 48"H 24"D MIRROR 54"H 48"W 6"D. THIS IS ANOTHER RARE, AND UNIQUE EXAMPLE BEING OFFERED FROM A PRIVATE 50+ YEAR COLLECTION. NOTE: ALL FUNDS MUST CLEAR, BEFORE THIS HALL TREE SET IS RELEASED. SUBJECT TO PRIOR LOCAL SALE. 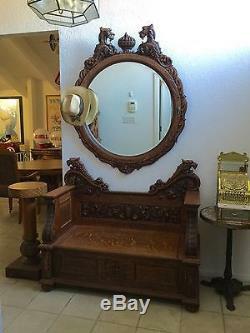 CHECK MY OYHER AUCTIONS FOR ADDITIONAL VICTORIAN FURNITURE, AND MORE QUALITY ITEMS. 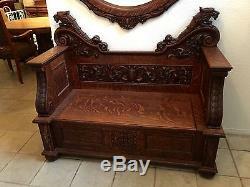 The item "VICTORIAN 1880 HALL TREE TIGER OAK QUARTER SAWN. ABSOLUTELY BEAUTIFUL" is in sale since Monday, May 1, 2017. This item is in the category "Antiques\Furniture\Hall Trees & Stands\1800-1899". The seller is "retrodon" and is located in Fresno, California. This item can be shipped to United States.